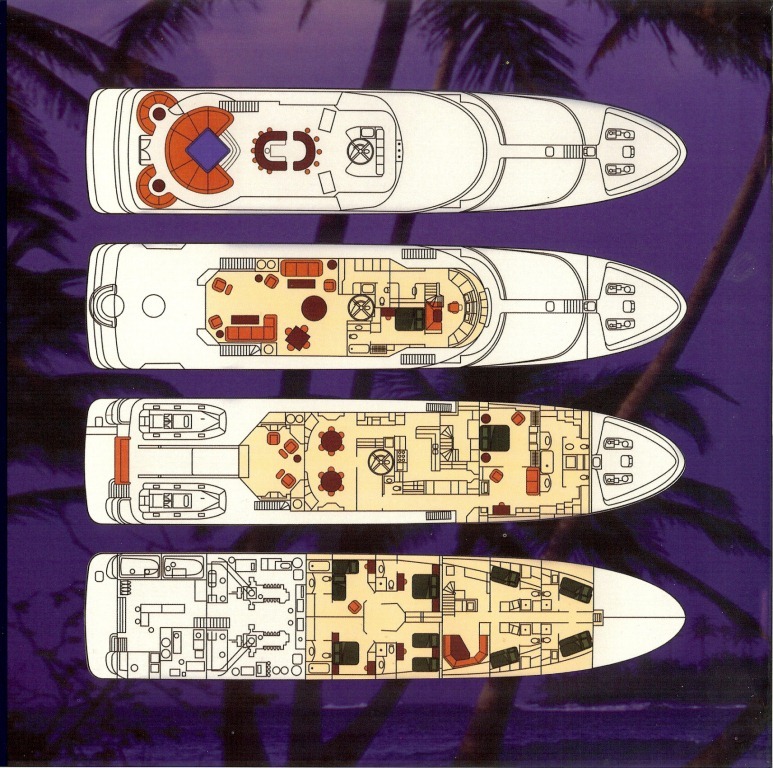 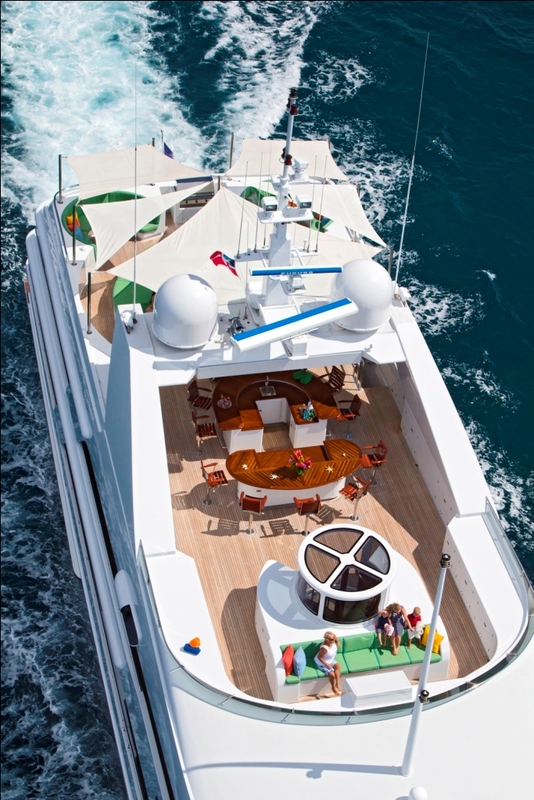 Luxury motor yacht RHINO was designed by Donald Starkey and built by Admiral Marine Works, in 1998. 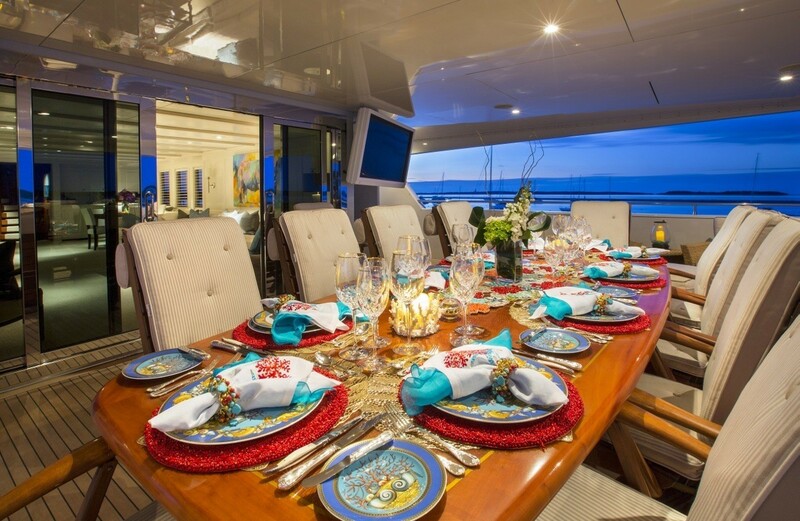 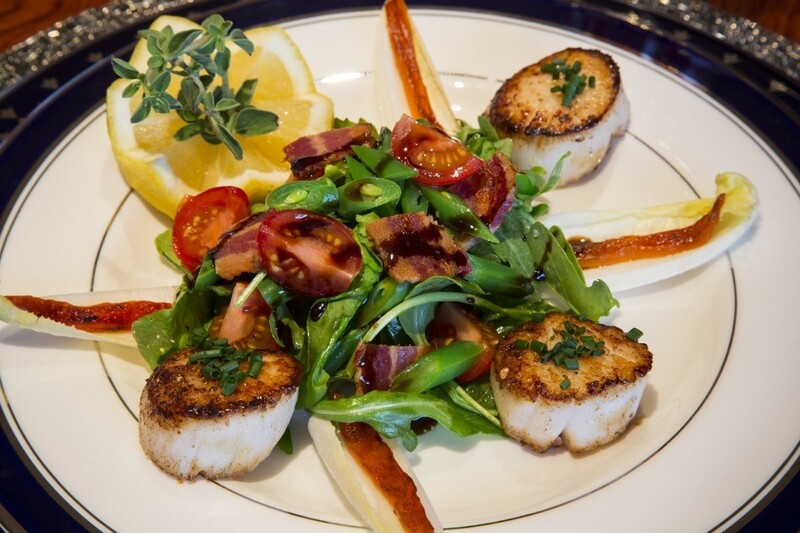 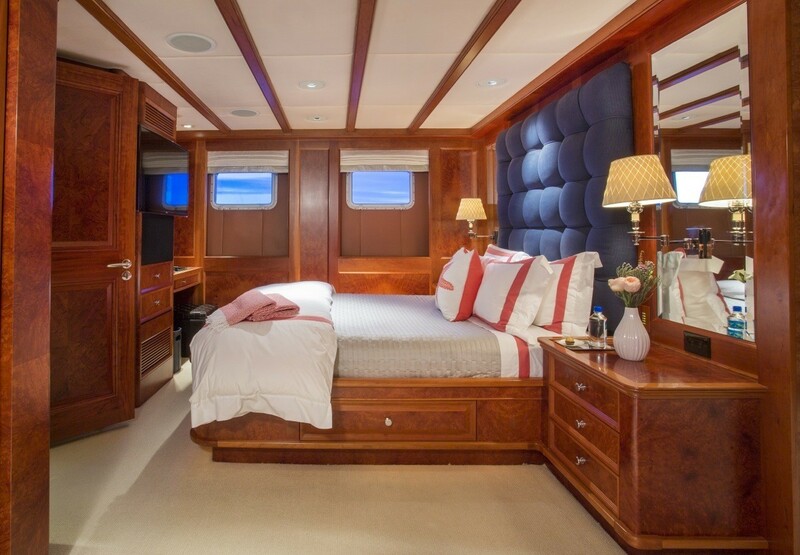 She is of contemporary classical style, and can accommodate 10 guests comfortably in 5 cabins. 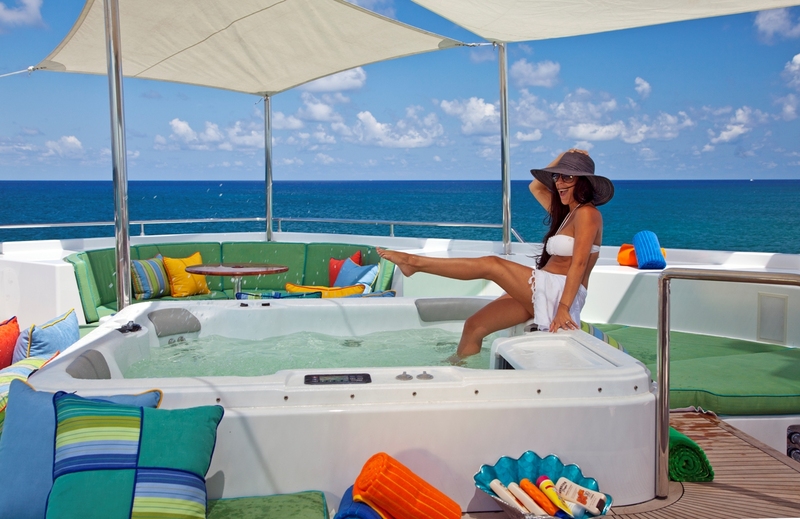 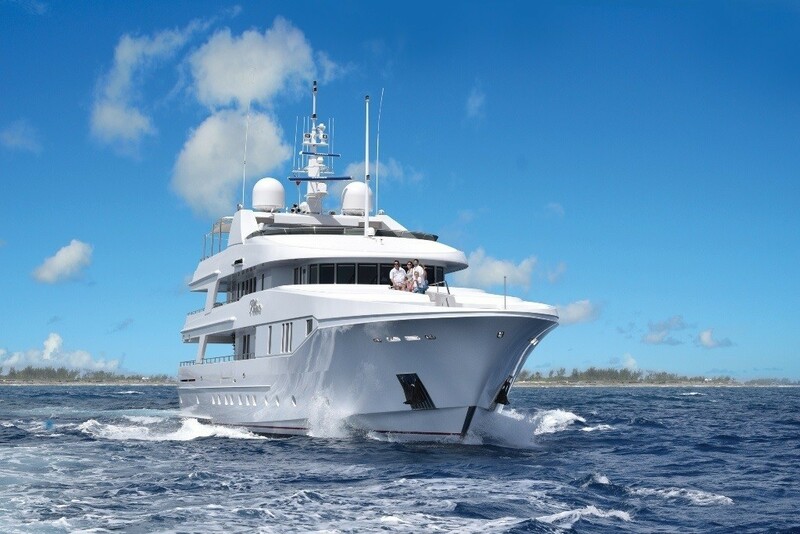 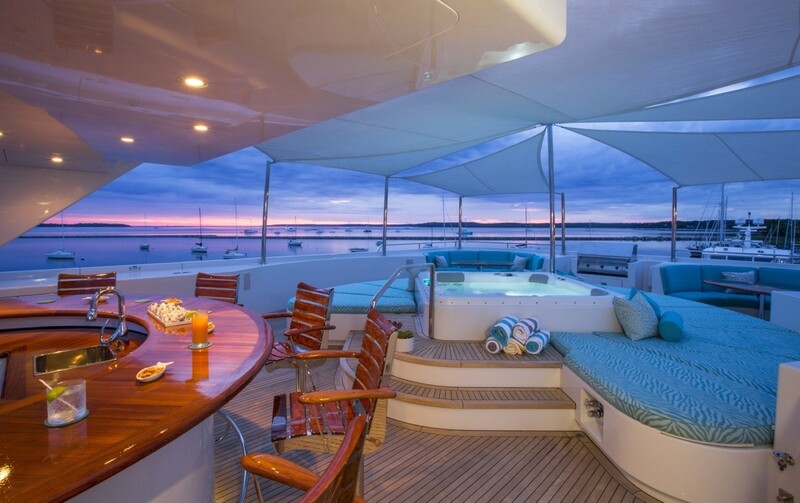 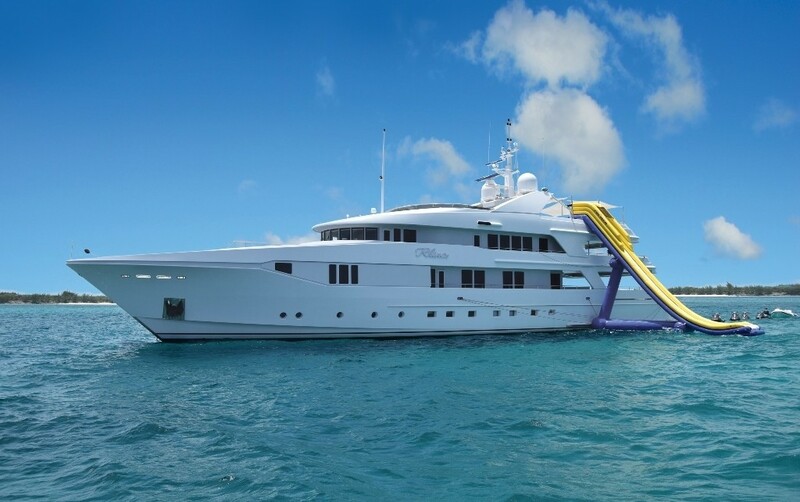 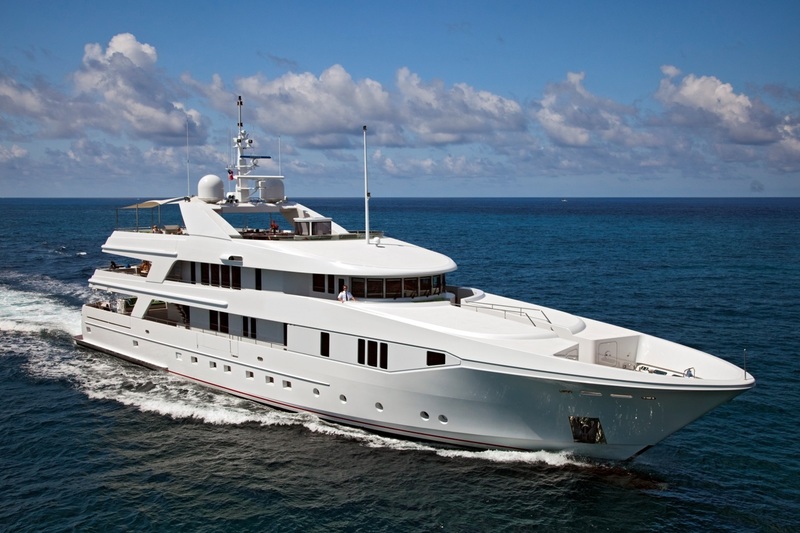 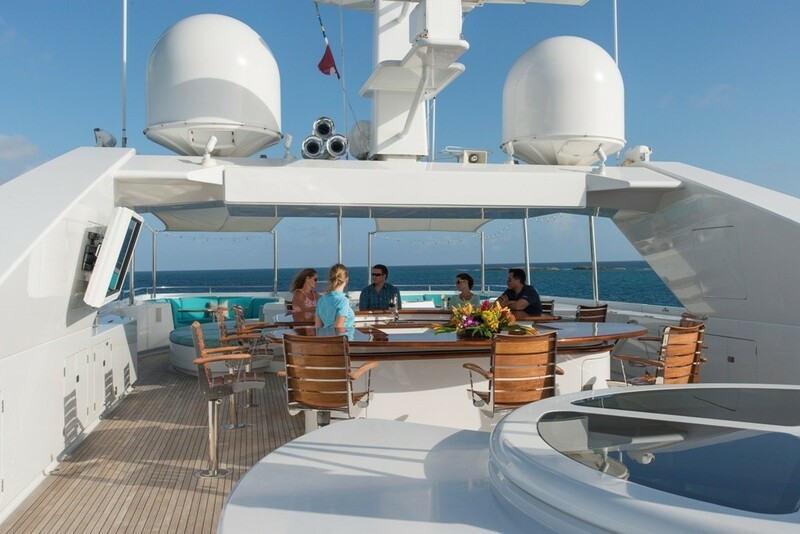 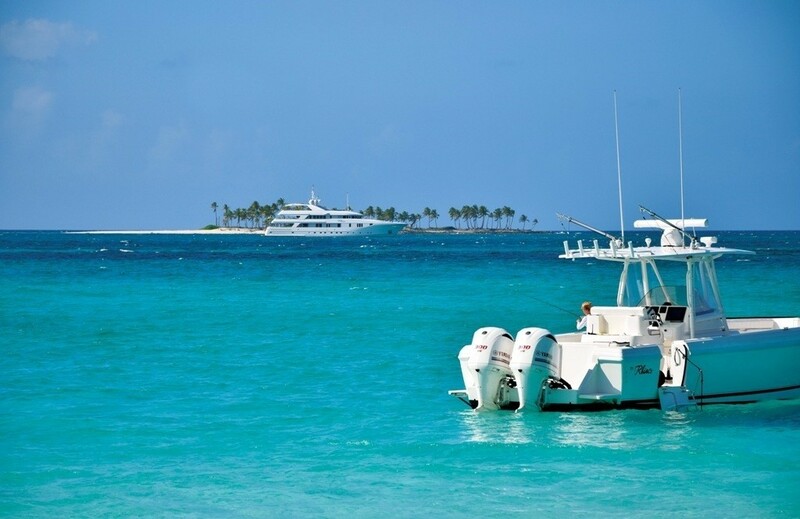 Available for charter in the Caribbean and the Bahamas, she is a dream yacht to charter! 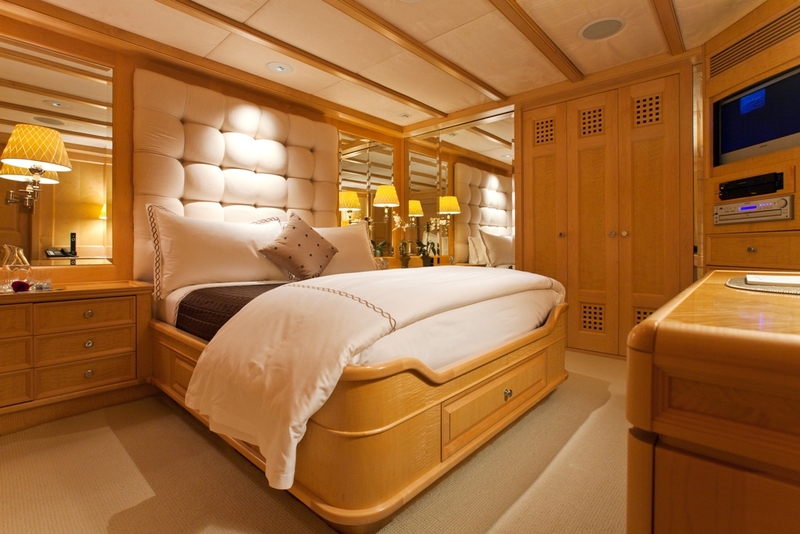 She is a world class motor yacht which was made with every attention to detail possible. 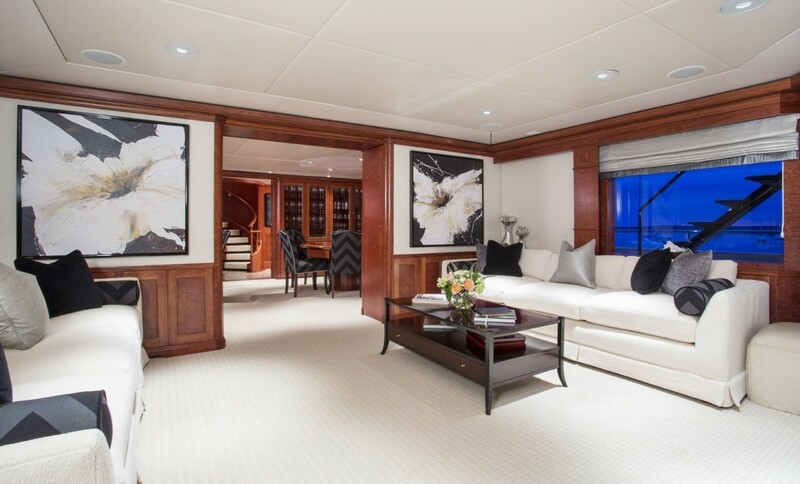 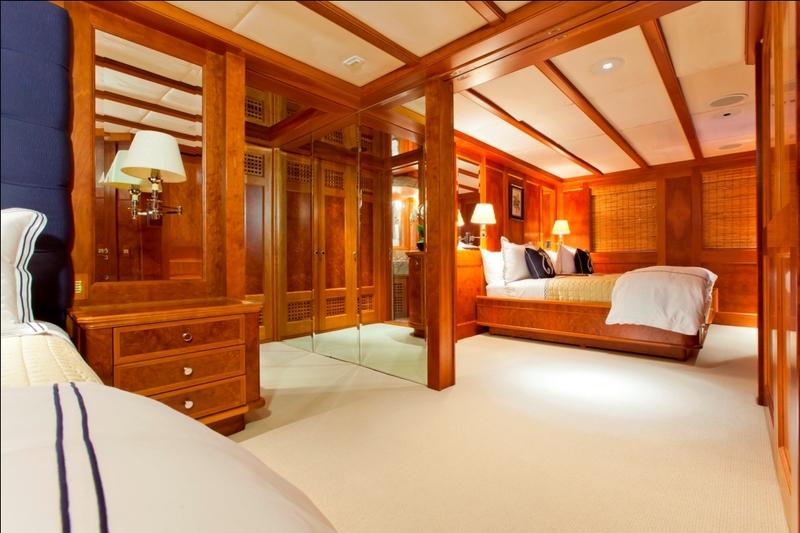 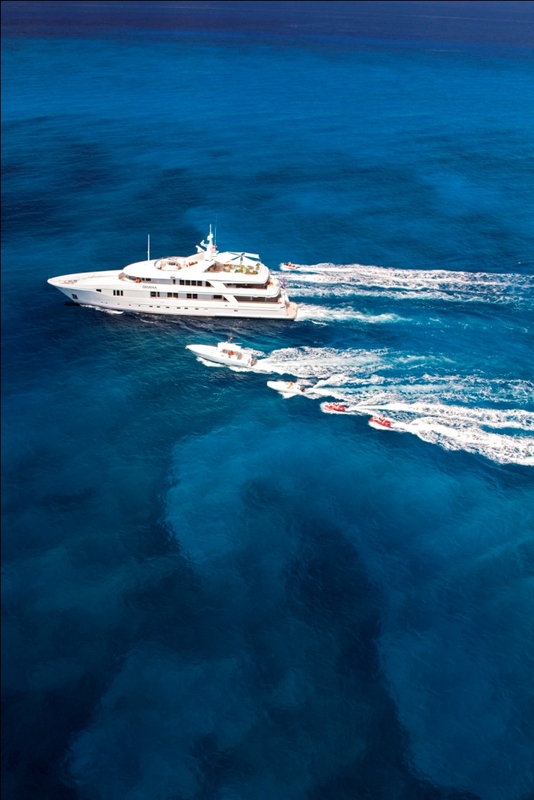 In 2005, M/Y RHINO underwent a refit and now has a completely new interior. 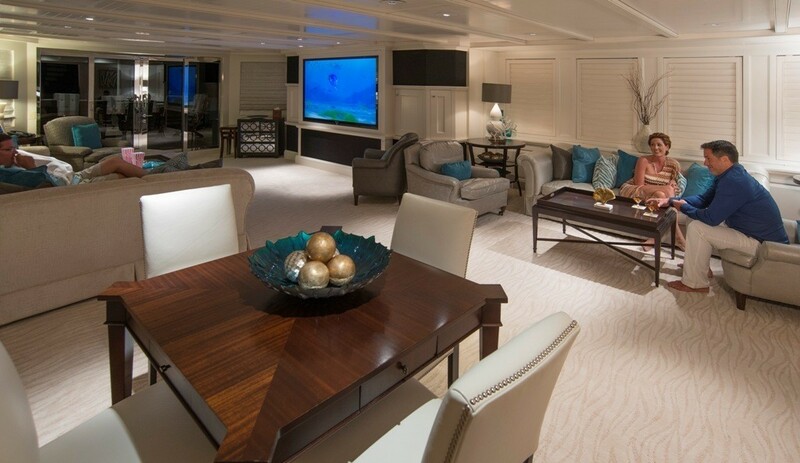 The electronics and stereo systems were completely upgraded. 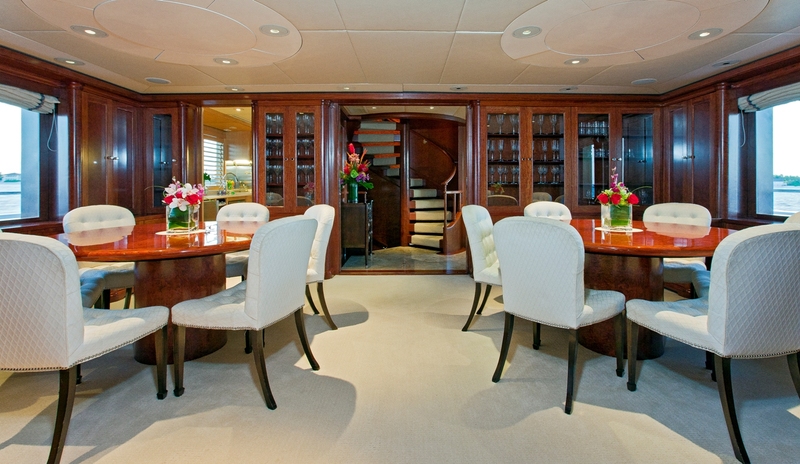 Main dining salon and cabana/media room complete refit in November 2006. 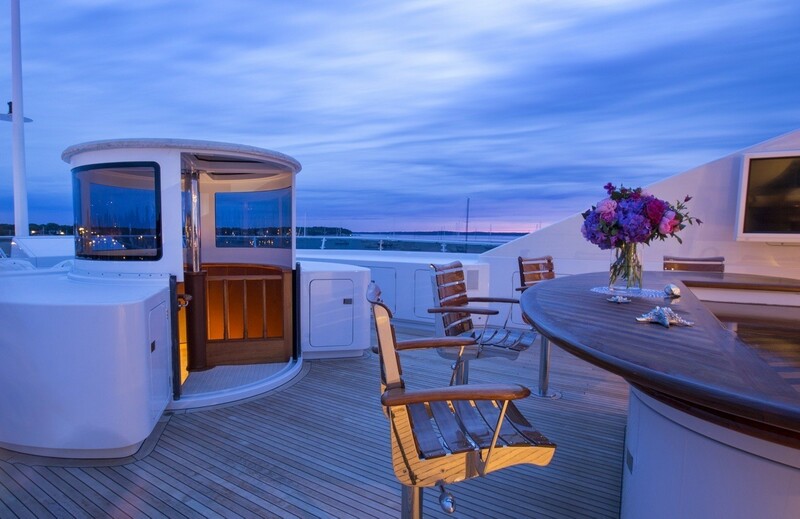 In the middle of the yacht is a circular stair case which provides access to the entire ship through all of the decks (sun deck to lower) – a feature usually only found on much larger yachts. 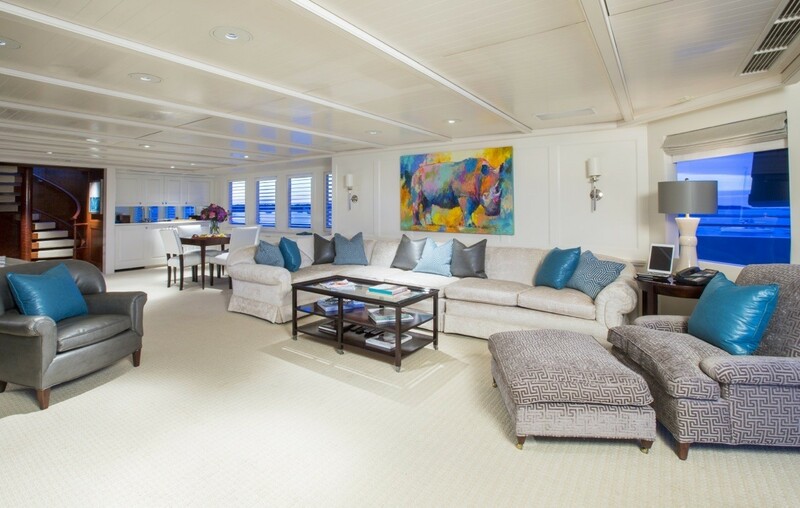 The main salon is on the bridge deck and is extremely light and spacious – there is a wet bar, a gaming table, and plenty of comfortable seating and tables. 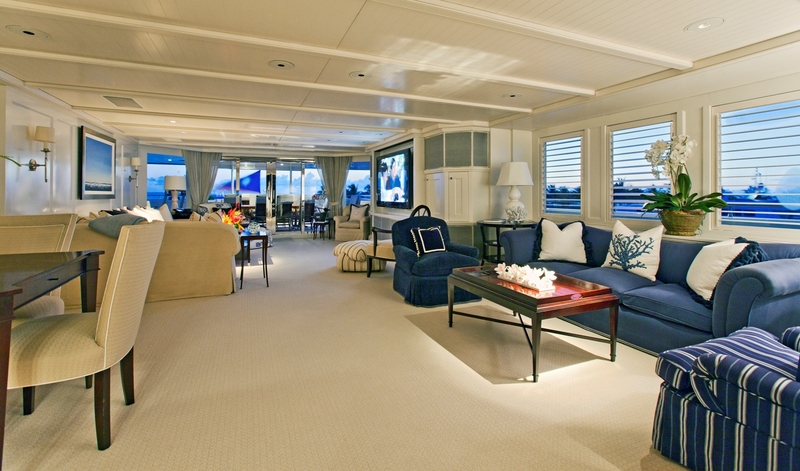 The bridge deck is well laid out with a U-shaped seating area for guests. 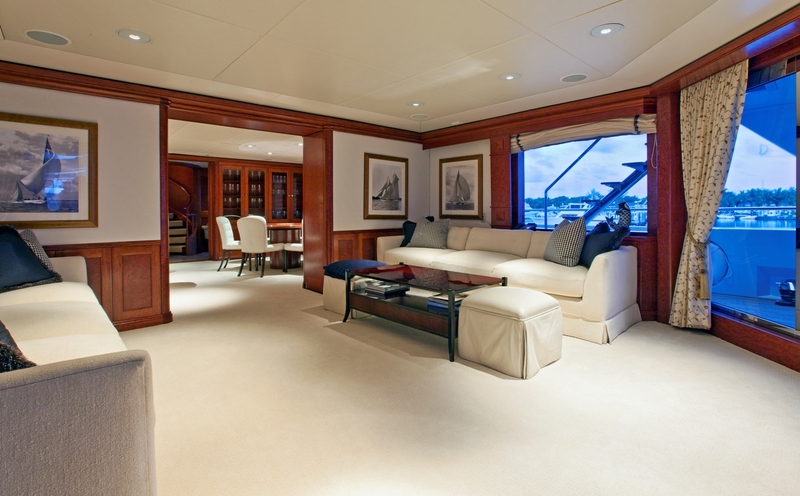 There is also the ships office to port, with all the normal office equipment and Satcom communication. 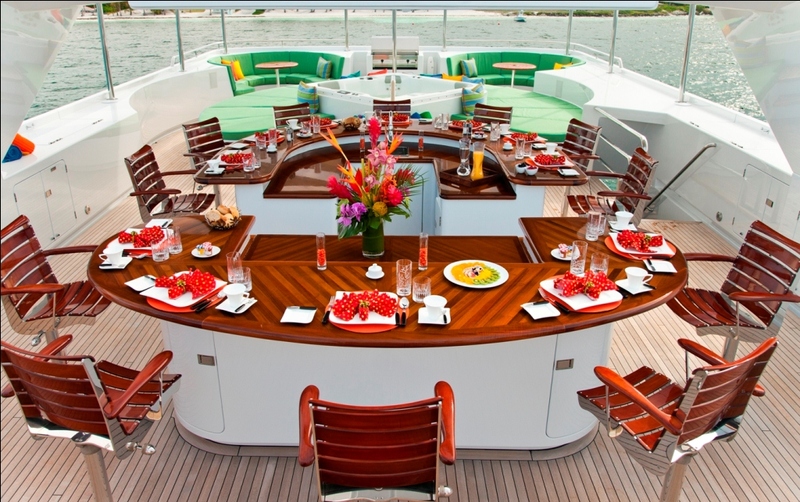 There are two U-shaped bars finished in teak with a total of 12 chairs. 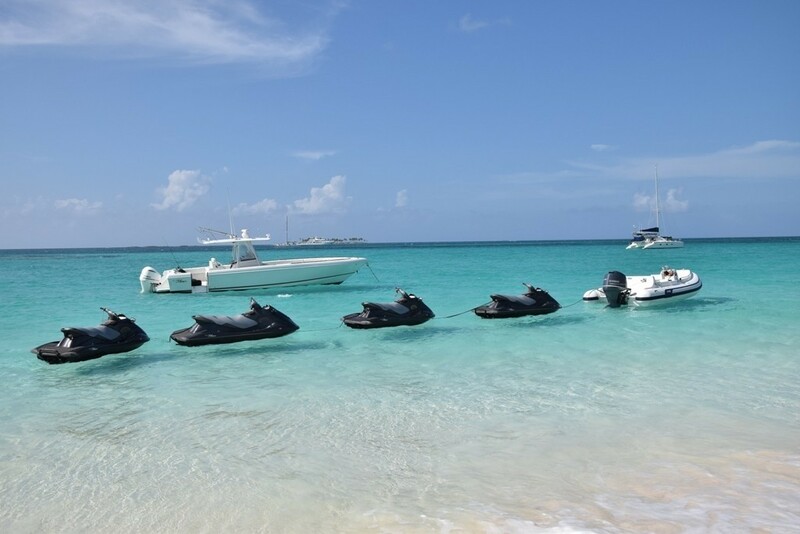 The bars are protected from the sun by electric awnings which can extend. 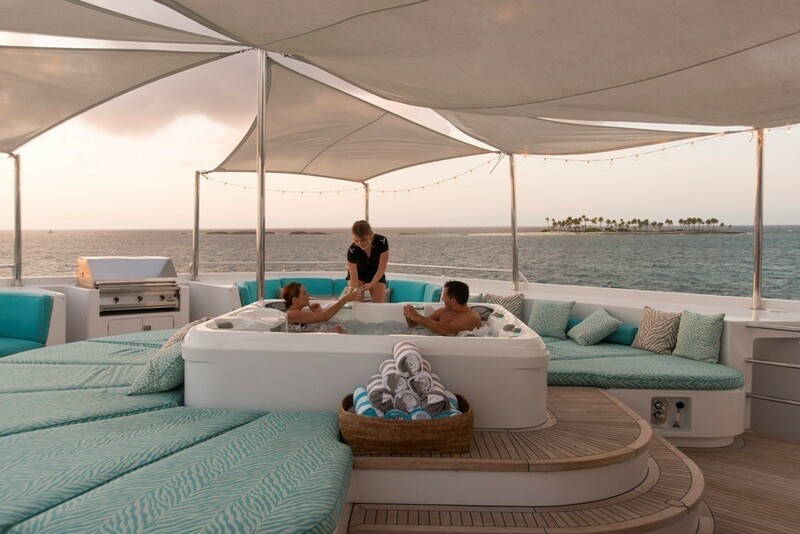 There is also a six person Spa Pool with sun lounging pads and a BBQ. 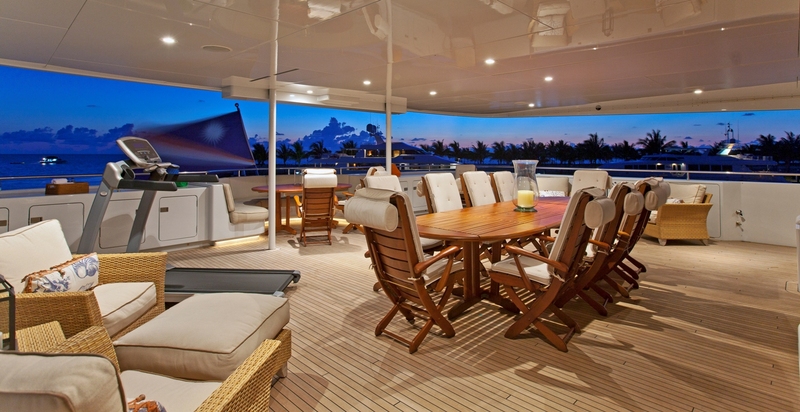 On the owners dining decks there is a teak table with 12 chairs for al fresco dining. 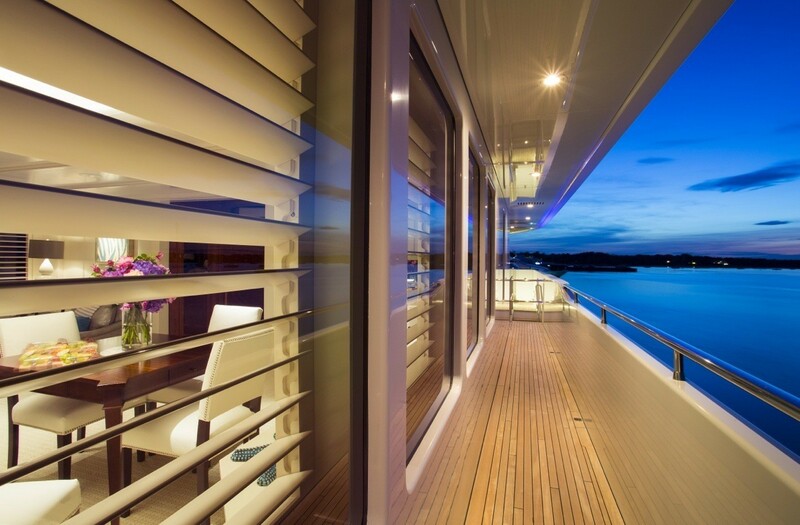 This deck is protected from the sun by the sun deck overhead, and also by an electric awning to cover the aft seating area. 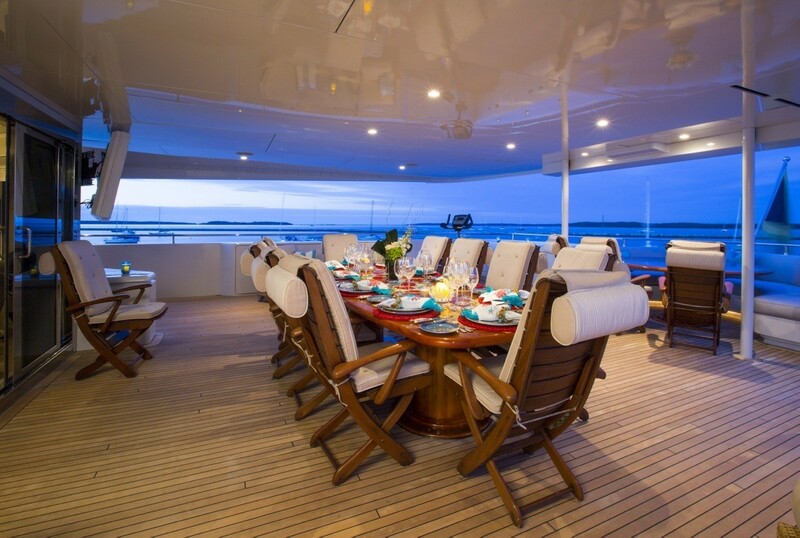 The dining room is arranged with two circular tables which each have 6 chairs. 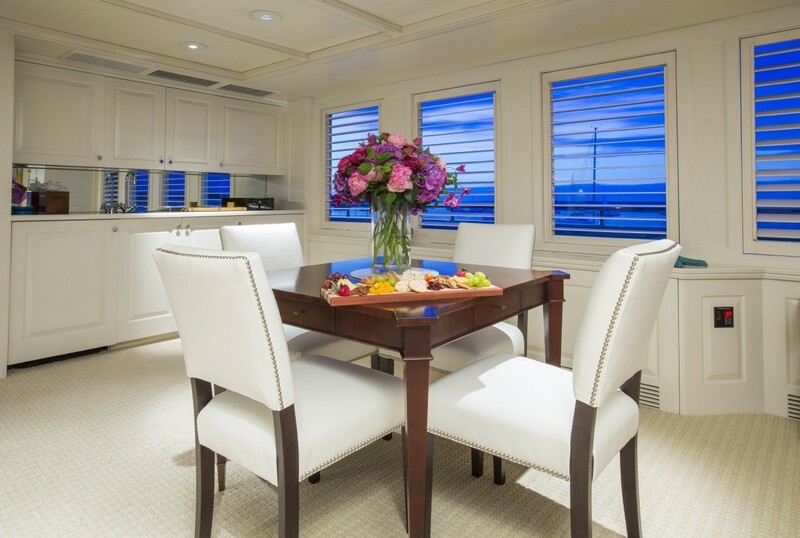 Aft of the dining room is another deck and entertainment centre. 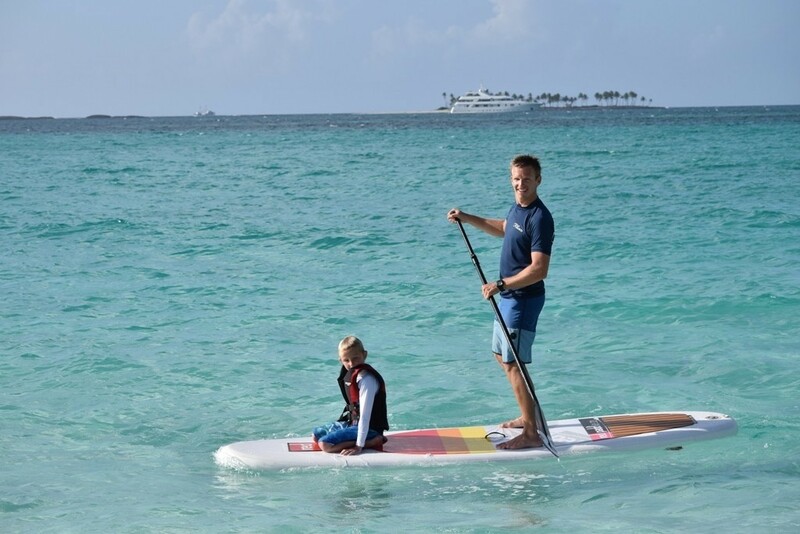 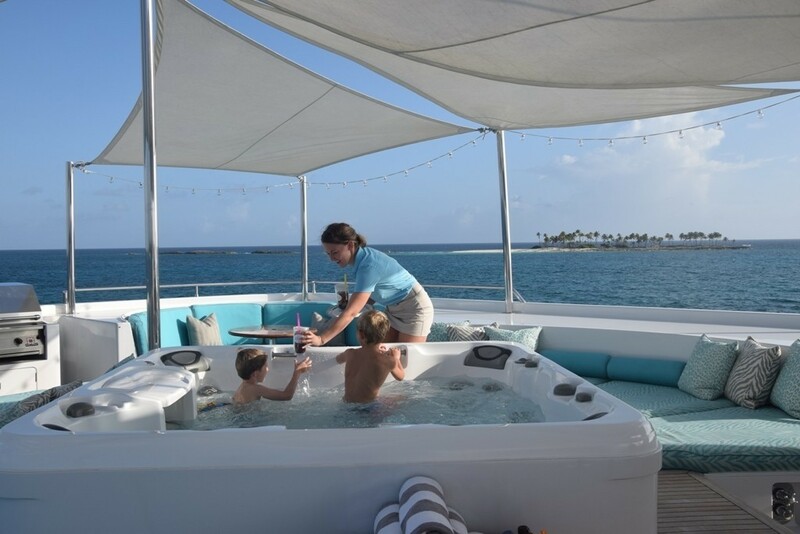 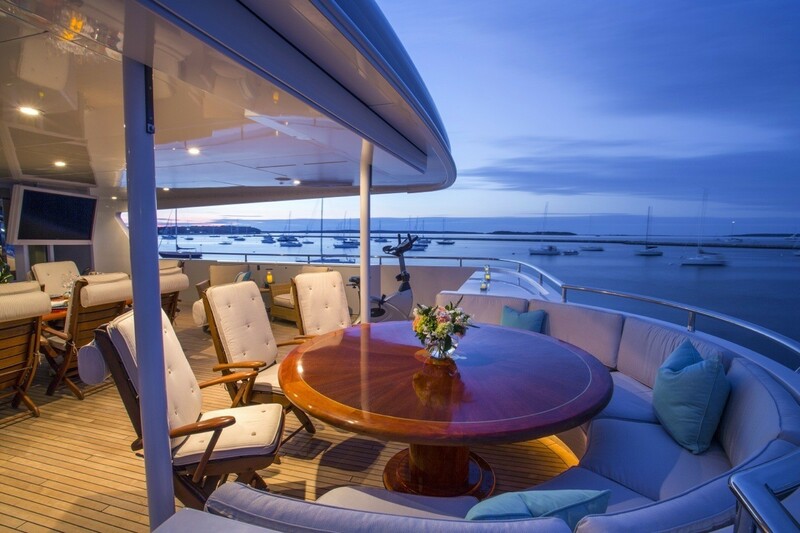 There is an excellent view out of the main aft deck through the double glass doors – this is an ideal room for children and games, with easy access to the water sports areas. 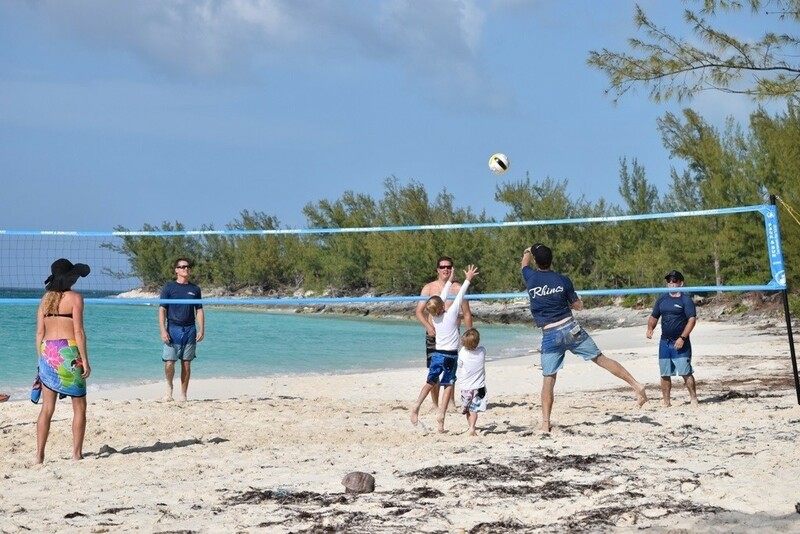 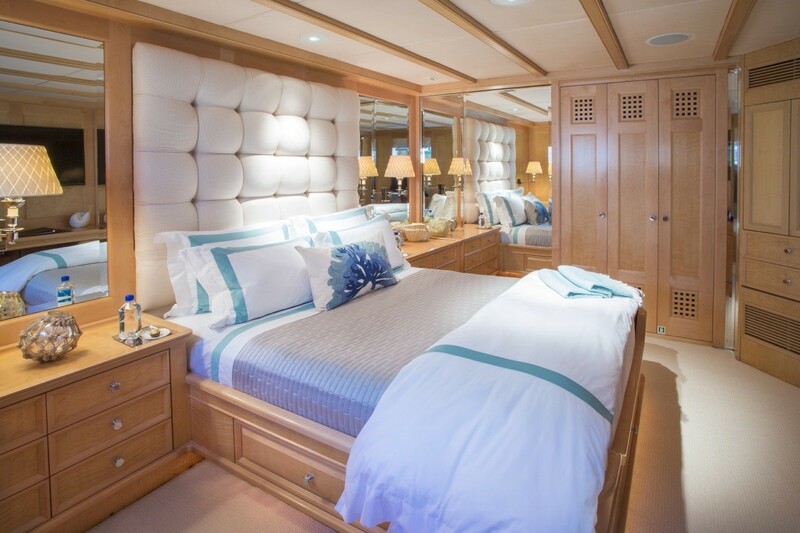 RHINO sleeps ten guests in five staterooms, and nine crew in four crew cabins and a separate Captains cabin. 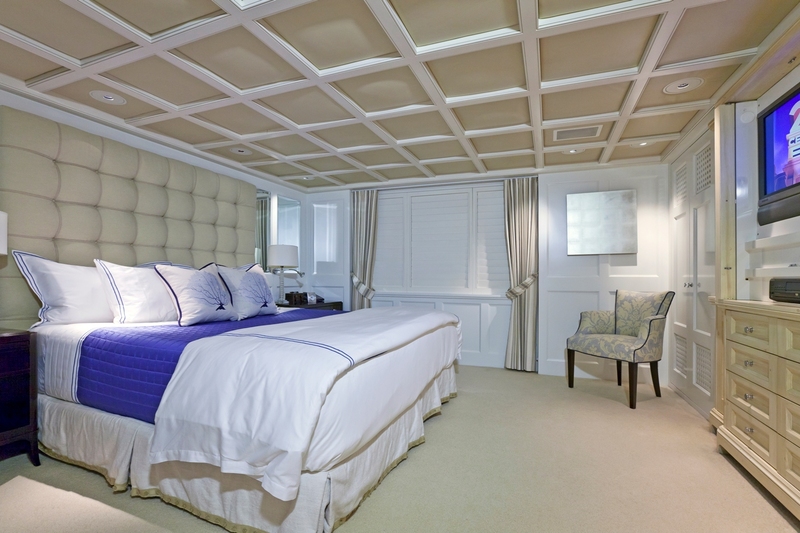 All four guest rooms are equipped with entertainment centres, computer network access, and ensuites. 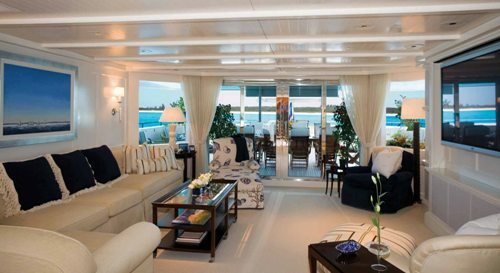 An oversized VIP room can be created by combining two adjacent staterooms into one spacious suite. 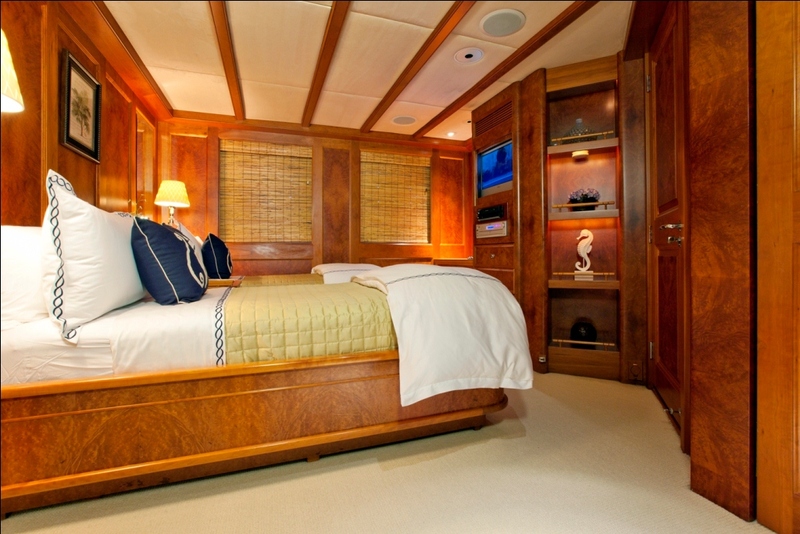 The full width master stateroom has a king size bed and his and her master baths with twin sinks, a central shower and a Spa Pool tub. 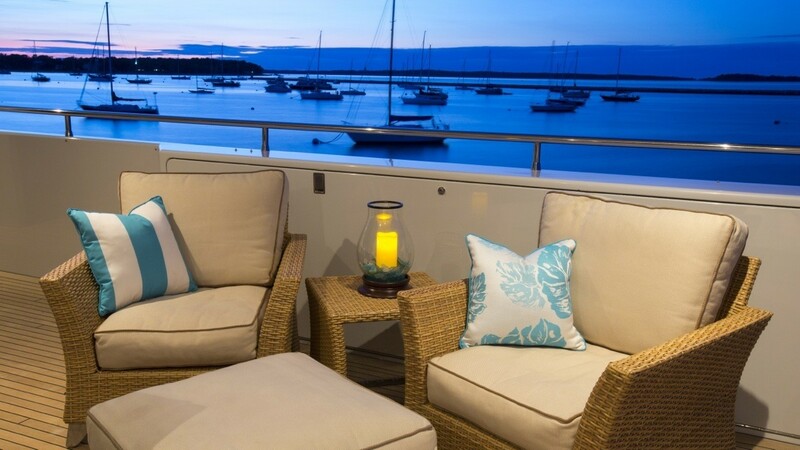 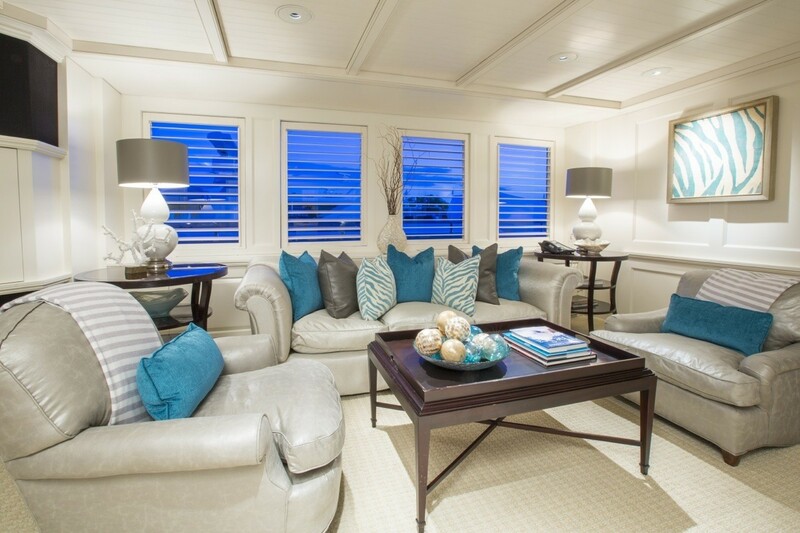 There is an owner’s sitting area with easy chairs, settee, book shelves, entertainment centre and deck. 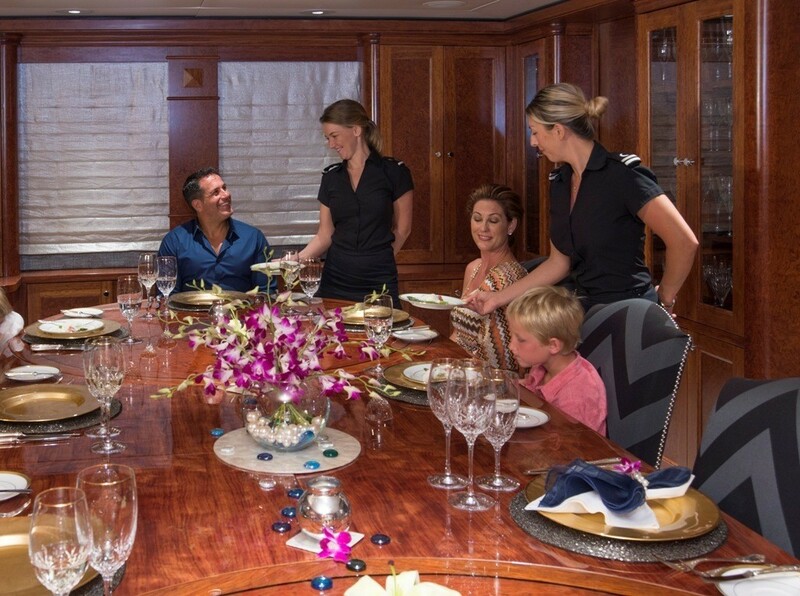 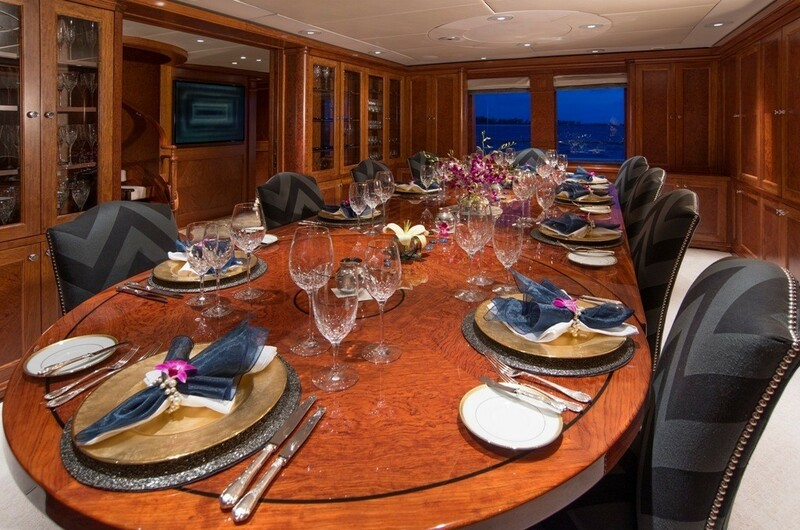 RHINO can accommodate ten guests on board in five luxurious state rooms. 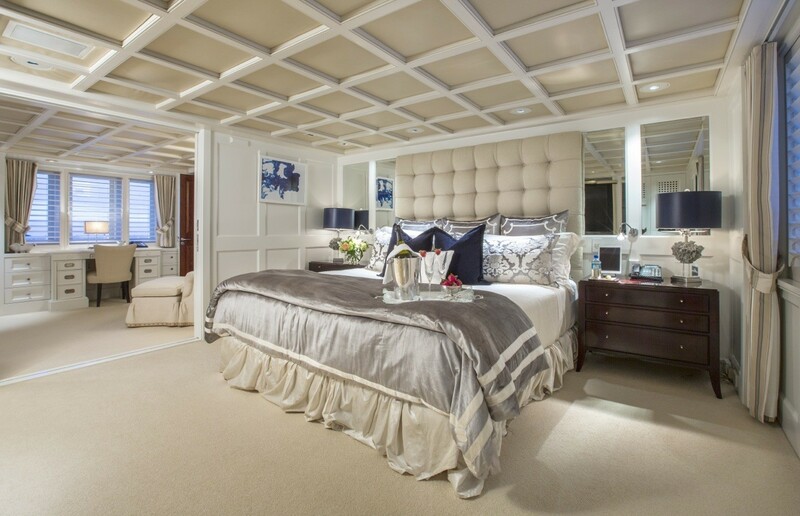 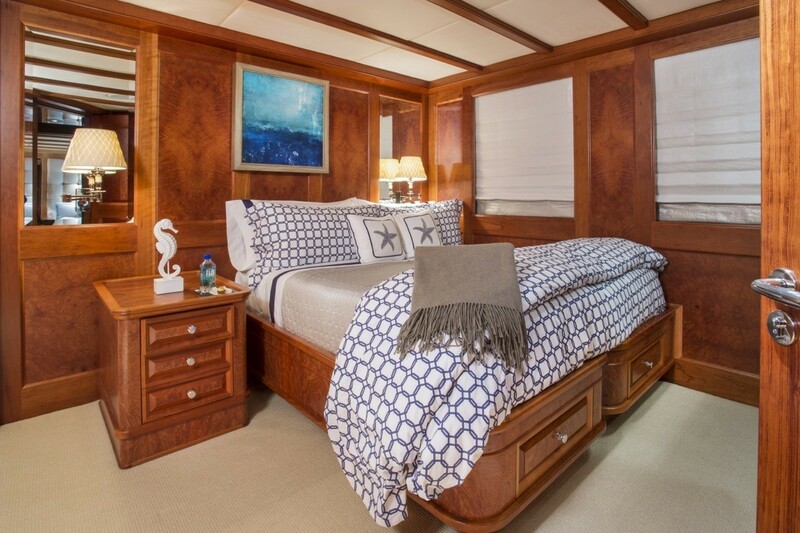 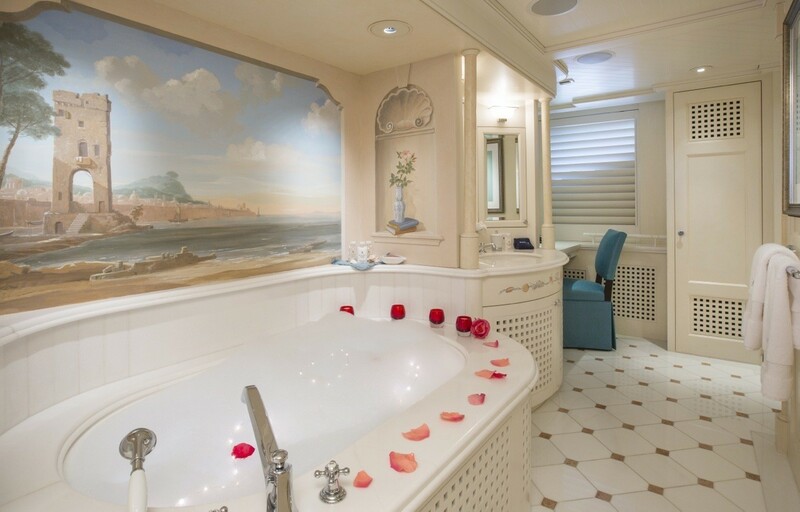 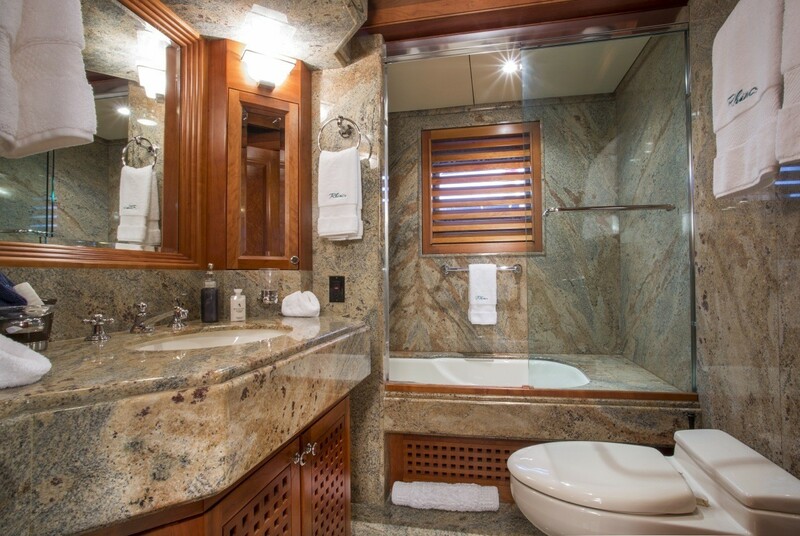 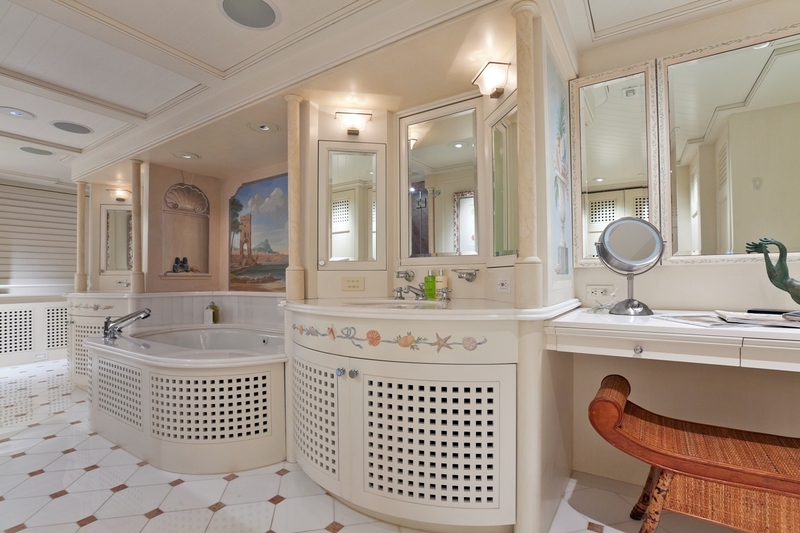 The full-width master stateroom has a custom king-size bed, his and her master bath with two sinks, two separate heads (hers with bidet), central shower and central spa pool tub. 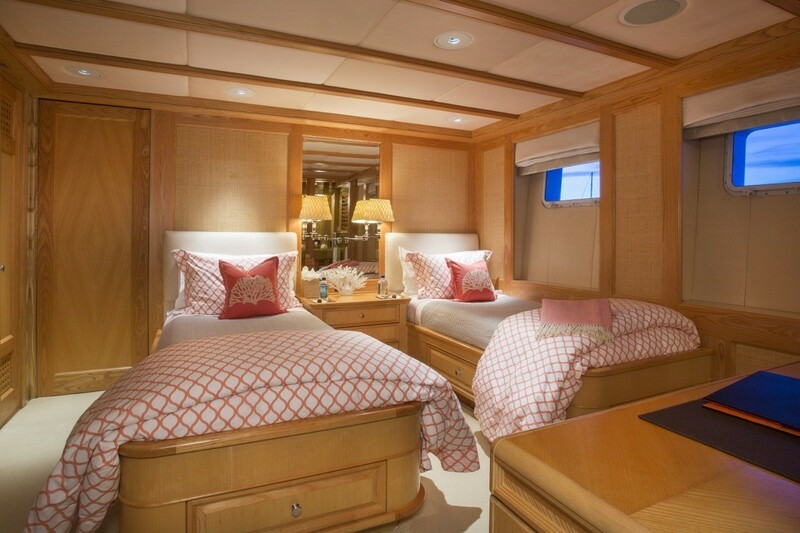 There are also two queen-size and two twin guest staterooms all with ensuite heads. 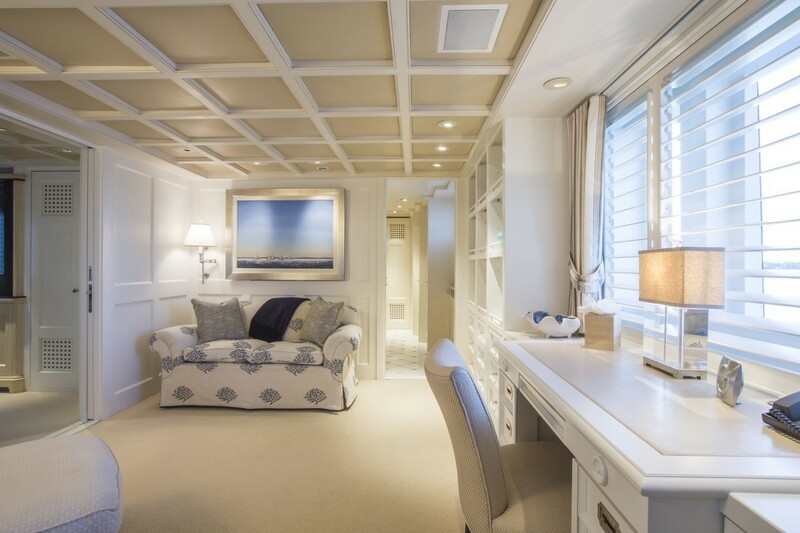 All staterooms are equipped with their own entertainment centers and computer network access. 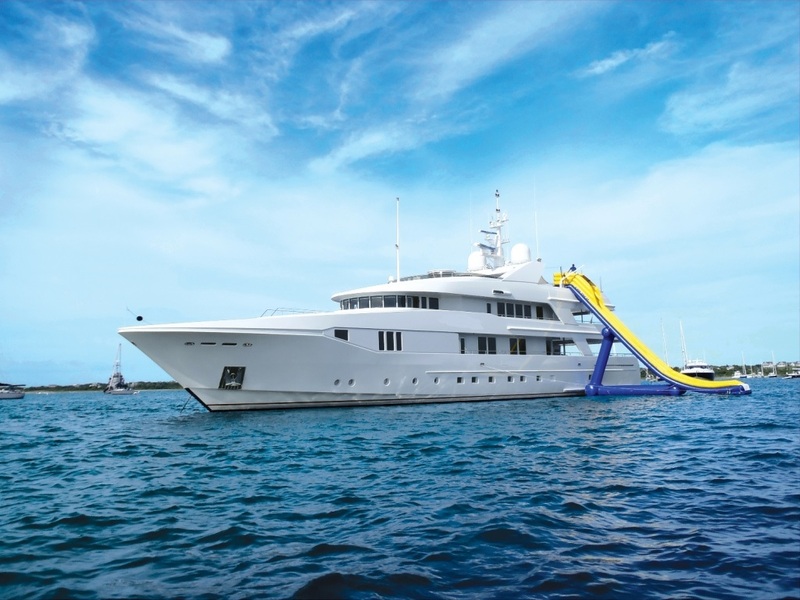 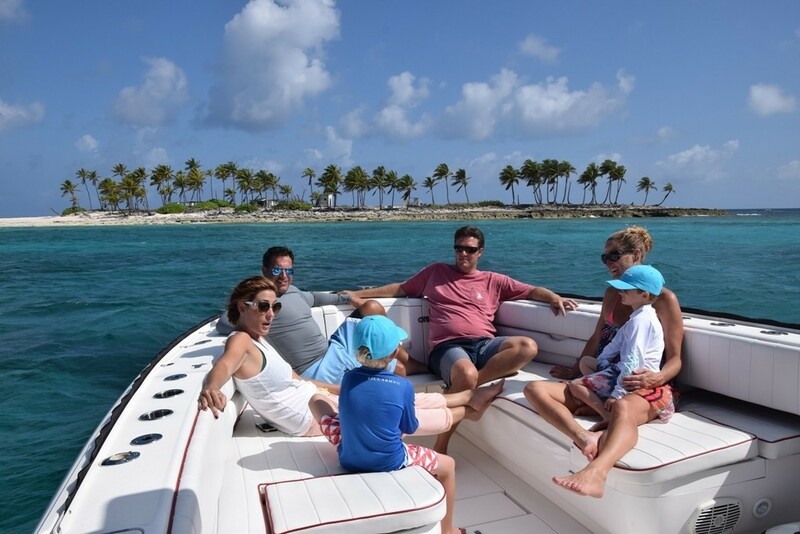 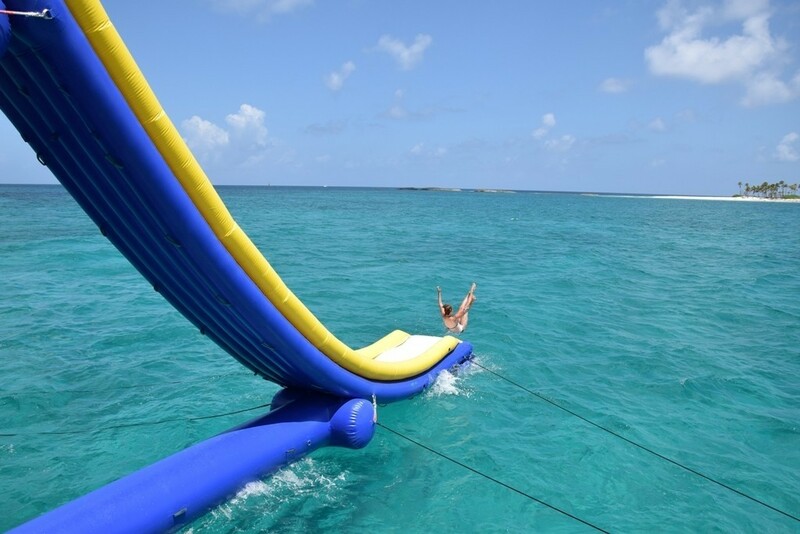 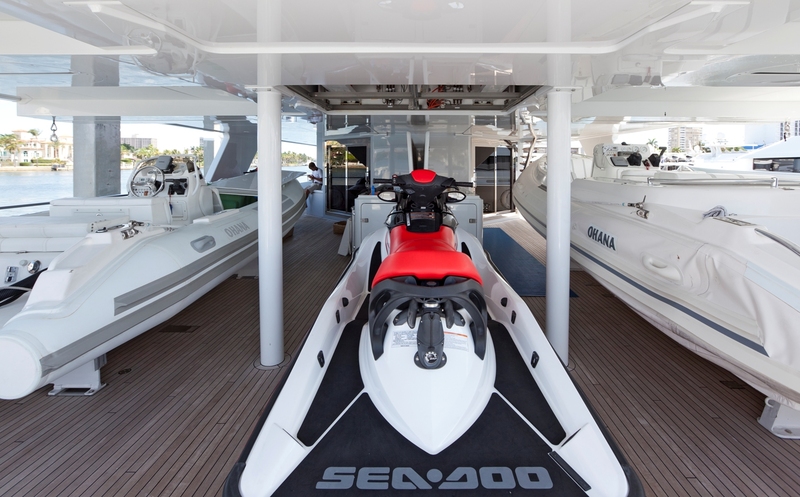 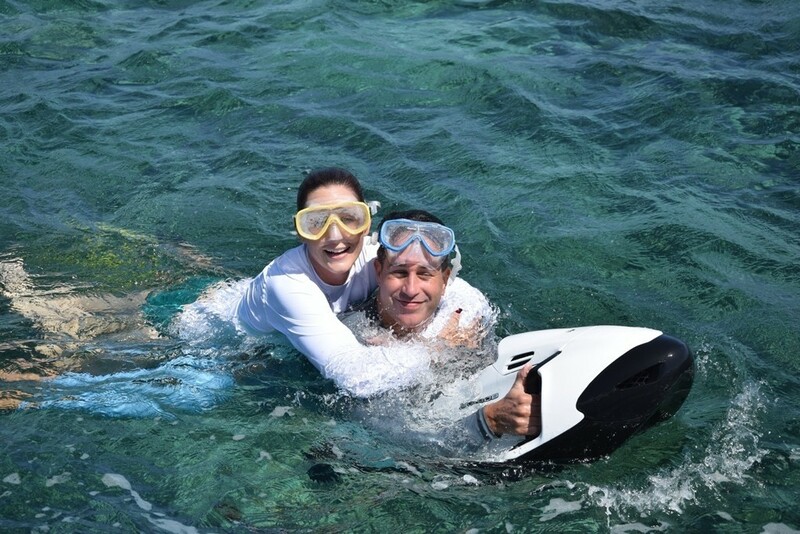 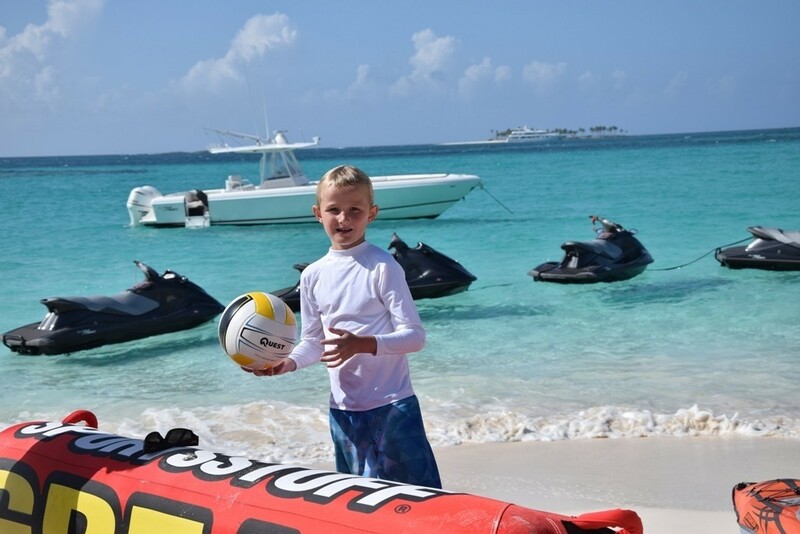 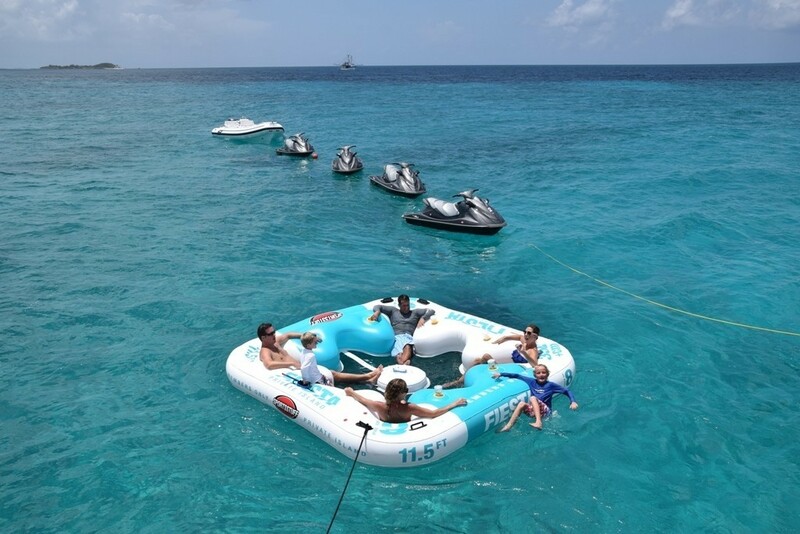 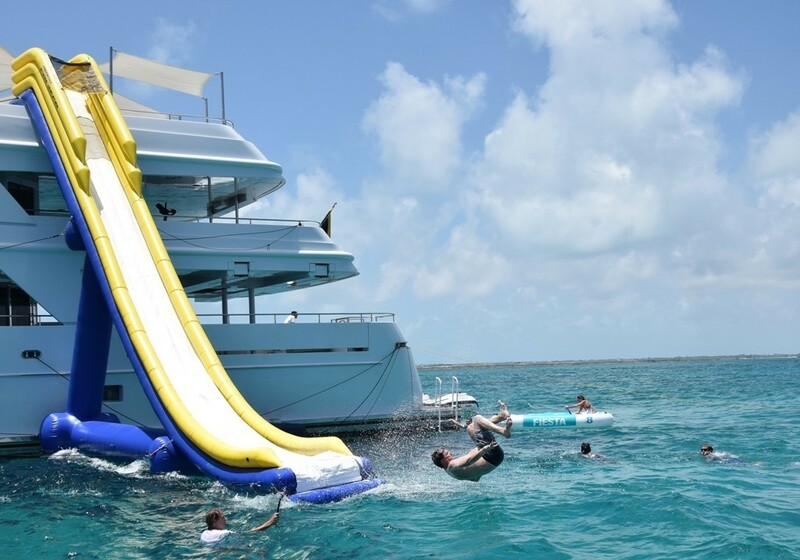 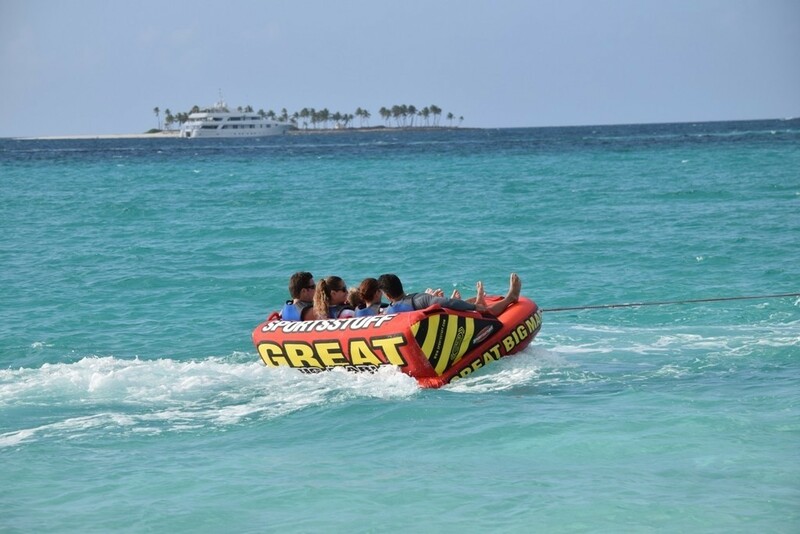 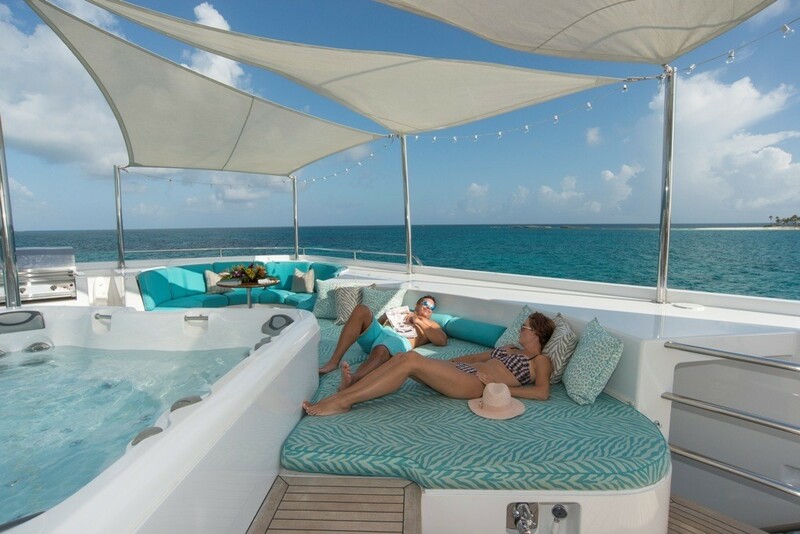 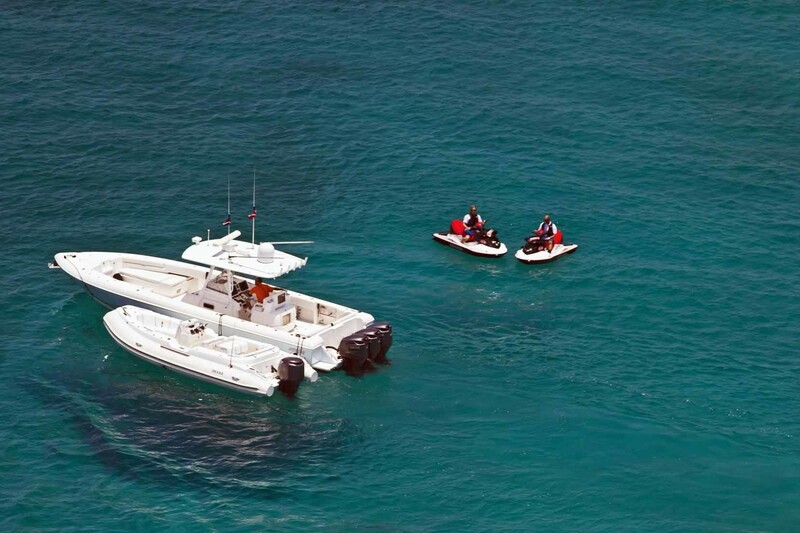 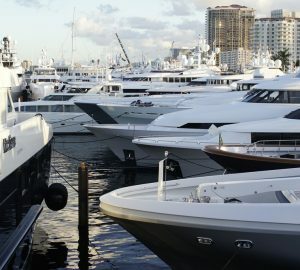 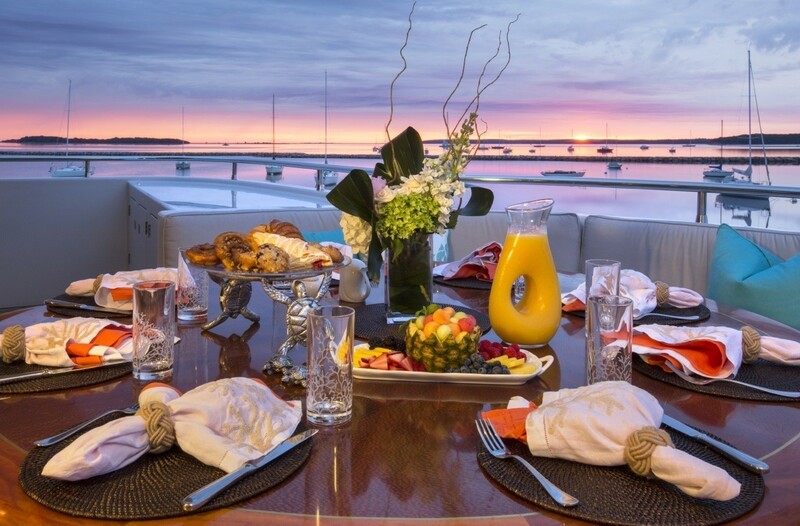 On board M/Y RHINO there are the following toys on board: A 37’ Intrepid towed tender, 22’ Novurania tender, 18’ Novurania tender, fishing gear, wakeboard and water ski’s, Miss Mable towable, AirRider, tube, snorkel gear, 40’ waterslide, water trampoline, 4 waverunners (2014), RYA training center, 2 SeaBob’s, 2 SUP’s, 2 inflatable 2-person Kayaks, treadmill and stationary bike, Xbox with Kinect, 6-person Spa Pool, iPod docking stations, Barbecue, wi-fi throughout, and Kaleidecape entertainment system.